Dr. McKee is a board-certified hematologist and medical oncologist with expertise in treating solid tumors, blood cancers and hematologic disorders. 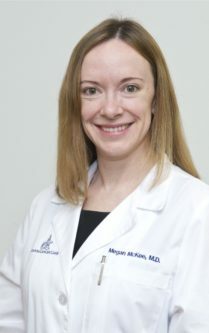 She completed training in internal medicine at the Emory University School of Medicine and was a fellow in hematology and oncology at the University of North Carolina at Chapel Hill. Hospital Affiliations: Northside Hospital, Rockdale Hospital, Piedmont Henry Hospital, Southern Regional Hospital and Dekalb Hospital. Dr. McKee has been involved in both clinical and translational breast cancer research. Northside Hospital researchers and Atlanta Cancer Care physicians work alongside respected industry partners and nationally recognized clinical trial networks to provide you with access to the latest treatments and prevention methods being tested through clinical trials. Prince G, Deal A, McKee M, Trembath D, Keith K, Ramirez J, et al. Examination and prognostic implications of the unique microenvironment of breast cancer brain metastases. J Clin Oncol. 2017;5(15_suppl):2072-2072. By NameAustin, Colleen S., M.D.Carter, Richard A., M.D.Chi, Ming , M.D.Mahmood, S. Tariq , M.D.May, Kelly A., M.DMcKee, Megan , M.D.Reddy, Silpa C. , M.D.Reddy, Sreekanth (Kanthi) , M.D.Sidhu, Gurinderjit , M.D.Simpson, Lijo , M.D.Steis, Ronald G., M.D.Tamim, Hiba , M.D.Zelnak, Amelia B., M.D., M.Sc.